While I am generally a huge fan of dynamo lighting, I do not have it installed on what is currently my only roadbike. My plans for the bike did not involve significant amounts of night-time cycling; it was not meant to be a touring or randonneuring bike. For occasional riding in the dark I do have an excellent rechargeable battery headlight that lasts for hours and attaches easily to the handlebars. And I have an equally good tail light that attaches to the back of my saddle wedge tool bag. To install a dynamo hub wheel and lights on this bike would have added unnecessary weight and expense to the build. I felt pretty good about my bike's lighting setup until I found myself wanting to join an overnight ride. Initially I thought that my super duper rechargeable battery headlight would last through the night. But when I did the math it became clear that it would not; I would need to add a second headlight and to bring several sets of spare batteries. Even at the height of summer an overnight ride in New England means 8+ hours of riding in the dark - and not the kind of milky suburban dark where you can leave the light on a low setting to conserve battery life; proper boonies dark that requires a powerful headbeam. I talked to the others doing the ride, and they all had dynamo lights. Now I felt foolish for not having a bike with appropriate lighting. But at the same time, how often would I do rides like this? I was discussing this with local cyclist Pamela Blalock and she offered to lend me her mobile dynamo setup: a spare front wheel with a dynamo hub, and lights that are easy to attach and remove. With this kit, she can turn any 700C wheeled roadbike into an overnight bike. Extremely grateful to Pamela for the offer, frankly I was also skeptical that it would work out. To me, dynamo lighting was something that gets permanently installed - not attached and removed on a case by case basis! Furthermore, my bike has no fenders, no racks, no braze-ons. Could the lights be attached securely? I was worried that the installation process would be tricky, and that in the end something would end up falling off, disconnecting, or malfunctioning. To my amazement, the installation process took mere minutes. 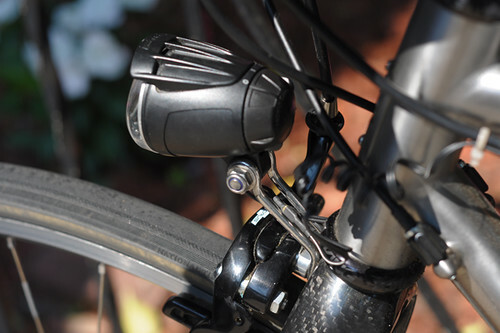 The front wheel switch was seamless and soon my bike was sporting a dynamo hub. Then the headlight was attached to the brake bolt, as shown in the first picture. A thin cable runs straight down from the headlight to the hub, easily secured to the fork with a piece of tape. For the tail light, a P-clamp was installed on the left chainstay. The wiring got routed along the chainstay and the top tube, secured with zip ties to the brake cable. The result was not beautiful, but neither was it flimsy. It was secure and problem-free. The positioning of the headlight and tail light beams were spot on. Later I learned that other local cyclists employ a similar system for when they ride in the dark - a dynamo hub wheel and lights that get moved from bike to bike as needed. I would not have thought this to be a good idea until I tried it myself and experienced how easy and hassle-free it was. On a dedicated randonneuring or touring bike, it makes sense to have dynamo lighting permanently installed in a more elegant manner. But for those who want the option of using their pared-down roadbike for occasional night time riding, a kit like this can be a good solution. Pamela's setup includes a 32 spoke Velocity Aerohead wheel built around a Schmidt SON hub, a Lumotec Cyo IQ headlight and a Spanniga Pixeo tail light - though many alternatives exist. 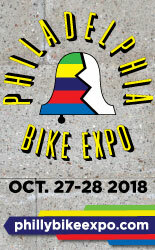 At least here in New England, there seems to be an increasing amount of cross-over between road racing, randonneuring, endurance events, and casual long distance rides. And this cross-over is influencing how roadbikes are defined and equipped. I am still unsure what kind of cycling I will ultimately gravitate toward. But if more night time rides are in my future, a versatile dynamo setup like this is certainly worth considering. Seriously, you need to stop jumping into my brain for story article inspiration! I think this is the fifth article in recent history where I was wonder about this exact thing! 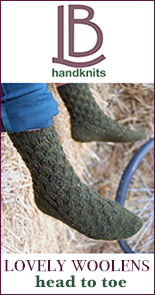 An intriguing idea, but not cheap and certainly somewhat of a hassle. I think a better idea is a high-quality bottle generator, which is not that permanent, either, but it could be. Plus there is no drag on the wheel unless the light is actually on. The cost depends on what parts you choose to use. By my estimate it's possible to get the whole thing done for aeound $300 total if you go with a budget rim, Shimano hub, etc. I considered the bottle idea, but the problem is that these bottles need to be clamped on *very* tightly and can damage the stays on a roadbike. I do think they ought to consider manufacturing specially designed bottles for road/racing bikes. In addition to the stay issue, not all tires have a sturdy enough sidewall to withstand the friction and wear of the roller. This would exclude the use of most, if not all, performance tires. I remember riding with one of these (different make) in the 80's, and as I recall it was nice, relatively low friction, but didn't last very long in the rain. I had a B&M bottle generator, and it did not last. Problems with bottle generators include: difficulty of keeping them aligned (on our bumpy roads), slippage when wet or snowy, noisy, spring failure (i.e., always on), and bracket (e.g., Zinkins) failure. Ultimately, my B&M failed to keep water out, and died, with little help from distributor or manufacturer. We now own several Shimano dynamo hubs (of various quality) and they all work well despite long miles for one of them (I think it may have 10,000 by now), outdoor storage 365/24/7, and who knows what abuse by children. In short, a bottle generator is a false economy. 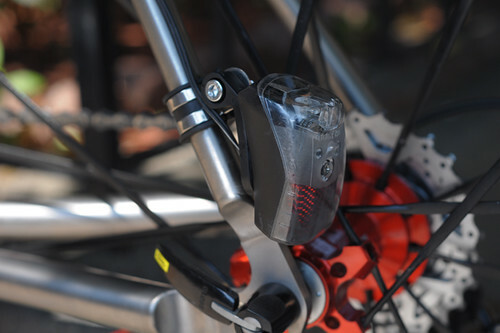 The drag is quite low on a Shimano hub if you disconnect the power, though the only time I disconnect mine is when I am checking the truth of the rim or the disk rotor -- my lights are always on. Hmm, it's been done like this forever. Especially with those who have a single bike used for everything. Fenders, lights, racks added when needed and removed when not. My own case, as well as the tribe I road with, had generators which attached on the chainstays -- where a kickstand may go -- and headlight easily mounted on the fork. These days it seems that many have multiple bikes for specific uses. Great if you can afford it, but still many, many, rely on a single bike and experience a range of enjoyment with it by adding and removing. A bit of a hassle at times, but economical. I would argue this isn't just for the single bike crowd. I have multiple bikes for specific uses and find it cost effective for them to share a single dynohub wheel and lights. Anon - We all enter cycling from a specific reference point that comes with its own rhetoric. The rhetoric I was exposed to early on was that temp dynamo and fender installs are a terrible idea - flimsy and prone to malfunctions, dangerous. Logical arguments and anecdotal evidence were used to back this up. It made sense to me and to some extent it still does. But the issue is not black and white. There are different kind of bikes, different circumstances. Something can be appropriate in Situation A, but not in Situation B, and vise-versa. I like your night-ready road bike! IMO, one dyno light/wheel set is wonderful to have for those special occasion rides, but it's overkill for most outings. My dyno light and wheel lives on my commuter (lights day and night!) and switches to other bikes as needed. Three of my Raleighs (1951, 1967, 1973-ish) are all blessed with front Dynohubs so I do not have to swap wheels. I have an original 1950's head- and tail-light set on the oldest bike - not brilliant but does work. I'm thinking of getting a modern retro-looking Lumetec for the younger bikes (the middle-one is my year-rounder) that should work well but I'm debating whether to get a generator-powered tail light as well, which affects the choice of headlight bulb. Go to Peter White's website to read all about generator lights. He's more than thorough on any product he offers and you will be educated. @V - in my personal experience, temporary installs are the time when things are likely to go wrong. It depends slightly on the design, but if you are going to get things wired backwards, that is when it will happen, and it is also when you may goof and accidentally leave a cable too short etc. A claim, from the computer industry long ago, was that when the technician opens the door to the computer, steps inside, and "didn't touch anything" the probability of a failure shoots up. Make of that what you will. I'm torn on the right way to deal with swapping things out. If you make your own lights (I do), it's not terribly expensive to have lights fitted on all bikes, with a dynamo-wheel to swap to the one that needs them. I'm still tinkering with the controller; for serious distances, you would want to be able to plug in a USB charger (and yes, I have built one, and it works for iDevices, just plug them in and go, and it is not too expensive: Circuit discussed or Circuit photographed.). @MaxU - yes, that is what I am saying. I build it, and once it works (it does not necessarily work at first), then I do not touch it. My own personal work has proven to be far more waterproof (on 5 different bikes) than the B&M bottle dynamo I once owned. None of my brackets (unlike the Zinkens I paid money for) has broken. There are two things that did fail "in the field" -- when I first upgraded from bottle dynamo to dynamo hub I did not appreciate how much more power was "available", and that burned out an over-power shunt (so strictly speaking, the circuit worked as designed). I tried potting electronics in GulfWax (sealing wax for jam) on my son's bike, and that turned out to be a bad idea because the wax cracked and then wicked moisture along the crack. Melted the wax, dried it out, and unlike the dynamo, all was well. Understand, my usual design is to solder it all together from end to end, with heat-shrink tubing fitted over the joints, and a minimum of switches that can go wrong (there is no off switch, for example). I use marine-grade wire when I can. This circuit here has been mounted on a bicycle stored outdoors for the last three years, and put through 7500+ miles of actual use, including rain, snow, slush, vibration, heat, etc. It comes on at low speed with almost no flicker, and at higher speeds it has less drag because it does not draw all the available current. That's my experience. Design and build conservatively, and then leave it alone. And design for repairability, so in the worst case I can take it apart and fix it. Thank you for sharing the details of the install; this Pamela is a genius! Did you feel a difference in how the Seven handled with and without the dynamo lighting? Long answer: There were so many new factors introduced into the ride - the novelty of it, the unusually long distance, the intentionally slowed down pace, it was hard to tell. Also, at the same time I replaced my tires with 26mm. I am sure that technically the dynamo wheel slows the bike down a bit, but the circumstances made me oblivious to the difference. Yes I rode the bike with that setup after the ride to Maine. But I still can't tell. Emily is so much stronger than me no matter what wheels and lights are on my bike, it hardly makes a difference. I am panting and she is like knitting and drinking smoothies, organising her bag... The drag from a dynamo hub seems kind of irrelevant at that point! SON dynamos at least have no discernible drag. "genius!" I like this commenter. More like this, please! This is a nice setup, and eliminates the need to carry spare batteries, but I think it's overkill for my use. I have an Ixon IQ rechargeable light, which is rated for 5 hours usage on high (and 20 on low, but as you say, you don't want that in the dark). I tested it once with freshly charged batteries, and at 5.5 hours, it was still going strong, and I stopped. The batteries in the light are four AA, so carrying an extra set of either charged NiMH or Alkaline batteries would allow one to get through a summer night with one quick battery change. It would take less than a minute to stop and do, as long as one had some alternate light source to work by. I'd have to do a lot more night riding before I could justify springing for a dynamo setup. Exactly. Current battery-powered LED lights give you more than enough light for at least 4 hours, which means carrying only one extra set of 2 AA batteries. Additionally, "more than enough" is really mostly too much light, if it is really dark outside and my eyes have adapted - normally I switch to the lower mode which gives me over 20 hours of light per battery set. Dynamo setup is, IMHO, more useful for touring than for the night riding of this type. i'm enjoying the close-ups. those ti drop outs are hot and the red hub is even hotter. i'd have a hard time riding any other bike. Ha. The stuff does nothing for me visually, but the last sentence rings true. I will write about the bike very soon. Clippy light idea -- me first, here. Borrowed dyno hub -- lucky.
" On a dedicated randonneuring or touring bike, it makesy sense to have dynamo lighting permanently installed in a more elegant manner." Why? 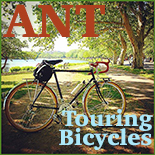 Touring & to a lesser extent rando bikes aren't used frequently. Say you have one of each plus a your bike. Makes no sense. It's boxes for boxes' sake. Want to tie up 1k in dynamo lighting be my guest. Used infrequently, but in situations where dependability is pretty critical. I can see having a wheel that swaps between bikes. But I definitely see the value of having the lights themselves 'permanently' and properly installed on a bike designed to use them in a non-trivial manner. Trying to strip and reconnect a small gauge wire that got caught on something and broke at midnight on the side of the road is a hassle. Does remind me to recommend always carrying small, battery powered clip on lights as backup. Light, cheap, and even the best system can fail. Make sure the headlight has a steady mode so is your go to flash light as well. Non-fetishistic solution: same wheel, quick connect on each bike. I know, too practical, not pretty. Just put a lug on it. Would you say people who keep batteries in their sunny sunday only convertibles and muscle cars are fetishistic as well? @MatthewJ They could be... depends what they keep in the locked trunk? I would say if the fetishistic shoe fits, wear it proudly. But don't run around telling people you aren't. JOHN BROWN!!! Could there be a better topic to illustrate not only the infirm state of modern "cyclists" but the very dark times we live in today!!? We found all but the darkest gloom EASILY penetrated by the simple expedient of a determined squint!! Lads would strike out for home in the dark after a satisfying day at the mill with one eye open the merest sliver and the other completely closed so as to enjoy a few moments of "shuteye" before dismounting at the door of the barn and begining the evening milking. This was before the coming of rural electrification when folks still UNDERSTOOD the value of even light itself! Why, for the simplest of tasks, many hale pastoralists kept their eyes FIRMLY CLOSED IN THE MIDDLE OF THE DAY TO AVOID WASTING LIGHT UN-NECESSARILY!!! Where are those so THRIFTY today I ask you? And as for those occasions when REAL illumination was required for nocturnal wheeling pursuits, WELL, one didn't settle for the dim, slim beams emitted by this centuries diodes, reflectors and tiny excuses for batteries( Batteries! Now there's a subject for a later date!!! Give me a good old 30 pound lead acid cell! Now there was something to give a man the pride of possesion that a nickels worth of nickel cadmium NEVER WILL!!!). BY GOD WHEN WE NEEDED LIGHT WE SAW TO IT THAT WE HAD LIGHT WITH ABUNDANCE!!!(!!!) Those in the know know I refer to the original gift from the GODS, no less than FIRE ITSELF! !!!! Would it surprise you to learn that the humble wire handlebar basket of today was originally a source of light sufficient to banish NIGHT ITSELF? OF COURSE IT WOULD!!! Restore to your "shopping basket" it's original damper, ash trays and reflector, add several pounds of good Pennsylvania anthracite and you'll soon SEE THE LIGHT!!! (pun) In the event that brighter light was needed one merely pedaled faster and FANNED THE FLAMES till it RIVALED THE VILLAGE SMITHY!!! No fey stringbacked "gloves" for us, INDEED!, elbow length ASBESTOS GAUNTLETS were the mark of the well equipted wheelman in those days. For an even brighter blaze one could do no better than to heave 8 or 10 pounds of FAT HAM in the hopper!!! I remember many an afternoon when some chums and I would stand at the back door of Muterspaughs Butchershop and throw pebbles at the chained Frenchman Old Man Muterspaugh brought back from "The Great War" as a trophy(some unprounounceable thing like "Jock" or something). We'd playfully peck stones off the back of his beret till he would pretend to get angry and shout "French" while throwing knives at us. What fun!! I'm sure he enjoyed it just as much as we since when his entire rack of knives lay scattered in the alley he could be counted on to throw chunks of fat and bacon rind at our heads. Just the thing to feed our handlebar beacons! Maybe I shouldn't admit it to this crowd, but we do actually have a few dynamo wheels in our household. The commuter bikes have dedicated wheels and permanently mounted lights, because ... well... they are commuter bikes and lights see daily use - at least for the member of our household who is still working. The tandems use different wheel sizes and have disk brakes, so they get their own dedicated dyno-wheels. Then there is the *loaner*. It's a newer lighter model than the commuters have, and gets moved around a bit depending on what bike I or John might be using for an event, or the occasional loan out of the household. The character of my bike can change drastically with the addition or removal of lights, fenders, handlebar bags and seatbags, not to mention the variety of tire sizes. From what I gather you use the stuff. Only somewhat relevant to this post, but I am thoroughly enjoying the cast of characters emerging as you befriend the cyclists in your area! Dynamo-equipping our cycles has probably prevented several traffic accidents through the years. My fronts and rears are on all the time, even in the rare Yorkshire sunlight. To be seen is to live. It also helps not to have to remember to plug batteries into chargers every night (but yes, even I could handle that daunting task). Most people aren't aware of how powerful and long-throwing dynamo lamps can be (LEDs FTW), and are astonished to discover that the bike that looked like a motorcycle on its approach is actually using that "old fashioned" lighting technology. As far as transportation bicycles, it is not a matter of academic debate for me - I need dedicated, bright and reliable dynamo lighting on what is essentially my everyday vehicle. Other bicycles, it remains to be seen. But then I use them very differently. I'm a little surprised not to see more promotion of daytime running lights (on my bike, on my kid's bikes) from the Effective Cycling crowd. They make a convincing pitch for visibility, AND DRLs are required on motorcycles in many states, AND studies have shown that they make even automobiles more visible. Interestingly, some people are sufficiently glare-sensitive to be bothered by LED headlights even in the daytime. My solution (affordable, because my lights are home-made) is "low beams" -- a pair of amber headlights on a switch, aimed lower than the regular headlights. Amber, however, does NOT retro-reflect from dog eyeballs, so it is harder to spot dog-walkers at night. I've never used them in fog or a snowstorm to see if they have an advantage over white; it's not clear to me how much fog lights work because they are lower (off-axis from your eyes) versus because they are amber (farther from your night-sensitive vision). I do know a white helmet light is worse than useless in a snowstorm -- all you can see is brilliant white snowflakes, right in your face. I'm with Jwink on this. Only yesterday I was looking at the Retrovelo website and the use a similar SON Lumotec set up on their bikes. Despite the extra weight (will it really matter to most people, really?) and drag I think it's the way forward, especially with LED technology. Another component for my dream bike build. These and hub gears - it's the future! battery and led technology are advancing so rapidly that i doubt anyone will be using hubs to power lights in the near future. and while i believe that some day ighs will be an acceptable alternative to derailleurs they still have large weight and performance deficits. for those who travel at slow speeds on flat surfaces this may seem like a fine compromise but my commute involves an ~800 foot elevation gain each am. Both of my bikes, general purpose and mtb, have Shimano 8 speed hubs and they suit me fine for cycling around the hills of the Pennines in northern England. I've ridden derailleur and hub and much prefer hubs. Each to their own though, so long as you enjoy the ride. I've been reading about the cushy ride quality of the slightly fatter 26mm tires, and am thinking about up-sizing when my current set of 23s wears out. Hope you take the time to review them sometime soon. Keep up your excellent efforts, on the bike and on the blog. The 26mm Grand Bois Cerfs feel like 32mm+ on this bike, I am impressed. Want to ride them a little more before I write anything substantial. Love mine so much I want to take my next tour on one but worry my luck with no flats (one plus year!) will run out as soon as I am far enough away from town. I have happily used bottle dynamos for years, even with relatively light weight tyres and have rarely had any trouble (apart from occasionally in the snow). Some are better than others, and you can get additional plastic or caps which fit most and improve efficiency no end. The secret is in alignment. 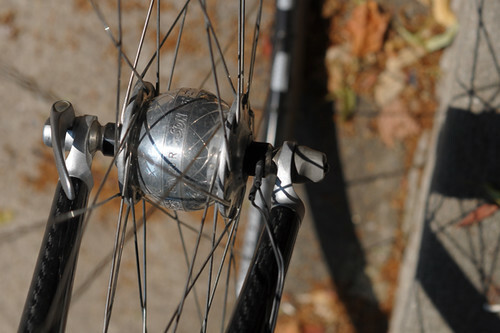 A straight line through the centre of the dynamo should intersect the axle of the wheel. Otherwise it will drag, slip and damage the tyre. Adjust it so the pressure on the tyre is the least you can get away with. Dirk Strothmann's KickStarter project (http://www.kickstarter.com/projects/dynamodirk/magnic-light-get-new-energy) promises a better solution -- he has bright LED lights with electricity generation that is powered by magnetic induction from the moving bike rims. Front and rear lights are powered independently. He won't ship until September, but it looks like it will work, and then it would be easy to move the lights from bike to bike without worrying about wiring. I've been watching that project and hoping it pans out. Do you think it's a problem that the front wheel does not match the rear? New England is much larger than England, and has a less than a third of its population. Even in crowded England's country lanes between the cities of Manchester and Liverpool, I get by with battery lights. Regrettably not available yet but very promising is a very small dynamo running on the wheel rim (no misalignment, no tire wall damage). 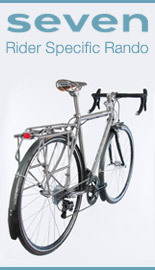 It is described in the May 2012 issue of VeloVision (page 38 and on). Specs in German can be found here: http://compact-tandem.com/rim-dynamo. Can be fitted on V-brake bolts or any other clamps on forks. Runs at far higher revs than a hub dynamo so can be smaller, and doesn't require a wheel to be built around it. The main problem for now seems to be that it hasn't passed German type approval yet so only available for export. I did this and didn't like it! You forgot "This is a miracle so smart / no it's not it's practical." yes! I was thinking exactly the same!